Talking about waterproof industrial socket and plug, there are two main categories for sale: IP44 and IP67. Besides the different grade of waterproof capability, other minor difference between the two types lies in the outer dimension, the design of the pin, the slot diameter. 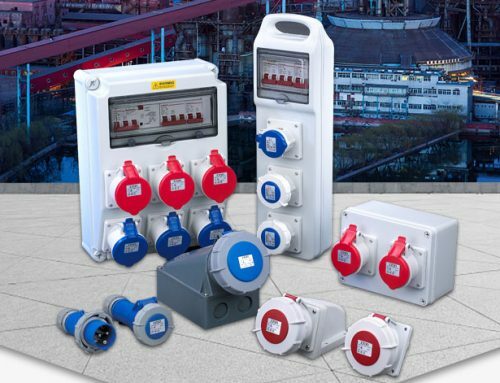 The IP67 plug consists of shell, ring, seal, pin, grip, cable clamp, cable seal, screw, etc. 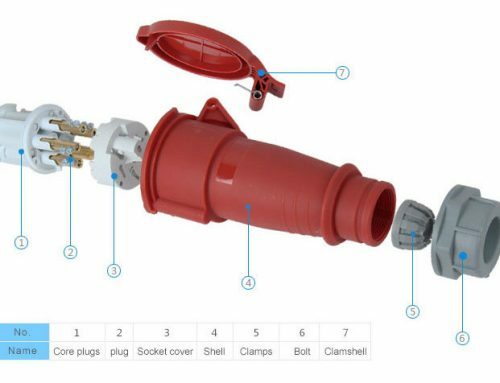 For IP67 and IP44 industrial socket and plug, they have basically the same structure, except for the shell, the section rind and the sealing ring. The shell is designed as a protection and enclosure for the pins inside. It is connected with the handler. The most important property for the shell is its water proof performance. 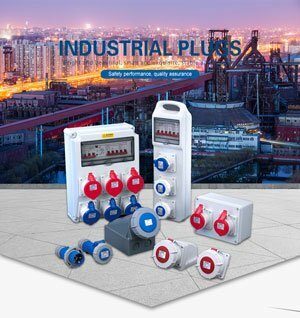 As a Chinese industrial socket and plug supplier, the shell that we manufacture is in full compliance with the standard of GB/T 11919-2001. 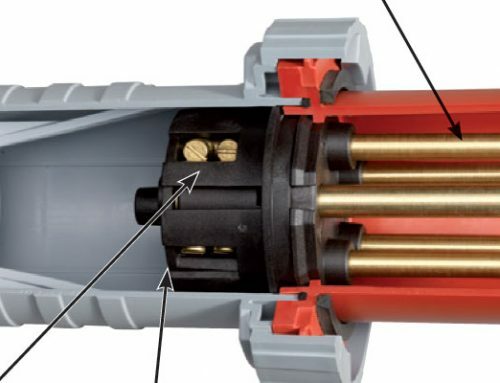 The handler, which is connected with the shell, is the other shell part for an industrial plug. The surface is designed with non-slip stripes. At the tail end, there is a cable entry. 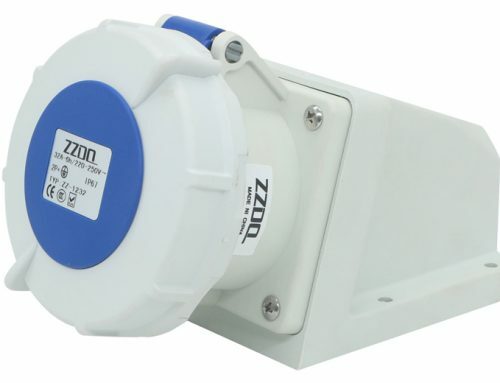 According to the IP67 standard, the cable entry is reinforced with thread cover, metal washer and rubber sealing ring. There are two types of shell, one-section typ, and two section type. Note that for the two-section design, the head section has the pin seat inside, while the tail section is only functioned as a handler. A sealing ring can be added to the section joint. When the lock ring is locked, it reaches the IP67 protection grade. It is the key part for an IP67 industrial plug. The lock ring can be freely rotating around the shell while the fixing tooth protects the lock ring from falling off. 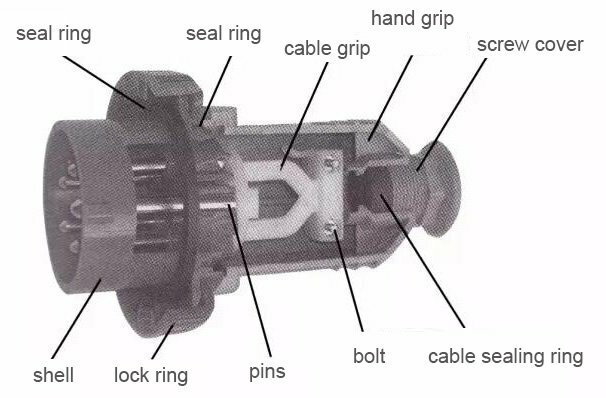 (a) the sealing ring used between the socket and plug insertion surface. (b) the sealing ring used between the shell and the handler. (c) the sealing ring used for the cable.